As compliance controls evolve from their emphasis on operating system and network-level visibility to encompass data assets (particularly the identification and protection of PII, PHI, and other regulated data types), the need to establish visibility, process, and assurance at the data layer becomes paramount. This means, among other things, being able to provide the “who, what, where, why, and when” of all atypical events related to your company’s data. 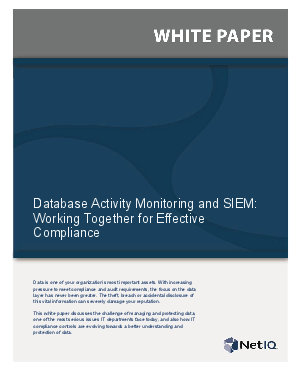 This white paper describes how to close this “compliance gap,” emphasizing the complementary relationship between SIEM and database activity monitoring technologies, which, taken together, provide a comprehensive view for organizations and auditors to keep data more secure while continuing to address compliance requirements.